On this Maine and Eastern Canada tour, get acquainted with the local culture, charming villages, and seafaring traditions of Nova Scotia, Prince Edward Island, Cape Breton Island, New Brunswick, and Maine. Start and end your vacation in Boston with overnights also in Bar Harbor, St. Andrew’s by-the-Sea, Digby, Halifax, Baddeck, Charlottetown, Saint John, and Rockland. 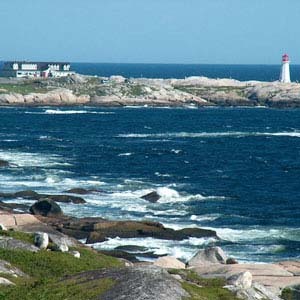 Breathtaking scenery awaits you on this tour through Maine and Eastern Canada. In Maine, visit Acadia National Park, home to rugged coasts and the tallest mountain on the US Atlantic coast. In Nova Scotia, spend time in the fishing village of Digby, with breathtaking beauty and views; stop at Lunenburg, a UNESCO World Heritage Site; visit Peggy’s Cove, a charming fishing village with a famous lighthouse (one of the world’s most photographed places); and take the scenic Marine Drive from Halifax along the Atlantic shoreline through picturesque fishing villages. On Cape Breton Island, drive along the world-famous Cabot Trail, named one of the worlds most scenic drives, and visit Cape Breton Highlands National Park, where the mountains and sea meet. Visit Prince Edward Island National Park, famous for its red cliffs, wind-sculpted dunes, and sandy beaches. In New Brunswick, visit Fundy National Park, with the world’s highest tides, rugged coastline, and waterfalls, and enjoy a guided visit of the Hopewell Rocks, famous formations carved by the Bay of Fundy with dramatic tides rising more than 50 feet. Throughout this Maine and Eastern Canada tour, Globus has arranged fun and unique experiences for you. For example, enjoy a private demonstration by a local fisherman who will explain the importance of the Digby scallop. See a typical fisherman’s house from the early 1900s when you visit the Fisherman’s Life Museum, and enjoy a picnic lunch with local wines along the Cabot Trail. All of this and more awaits you on this spectacular tour! Baddeck, the famous summer home of Alexander Graham Bell, has a lay-out similar to a modern New England Village and is easy to explore on foot. This spot of natural beauty is also ideally located near the Fortress at Louisbourg.